Little Briar is a pet friendly, 2 bedroom stone holiday cottage in Scotland, which faces south with spectacular views over Loch Earn to Edinample Castle in the village of Lochearnhead. The cottage has a compact kitchen area off the dining lounge, plus a bathroom with a electric shower, double room with loch view and a twin room. A separate driveway leeds to a parking area for 2 cars with a ramp entrance to the front door. The all electric facilities incluide Sky TV/DVD/Video with a £1 slot metre to top up and Wifi. 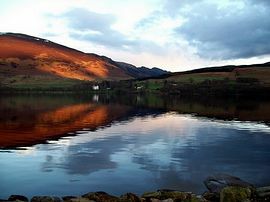 The cottage is open all year round with stunning scenery in every season. 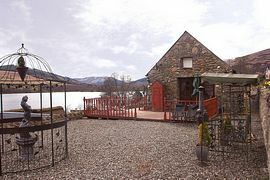 Guests can fish free from the owners 250ft lochside garden March 15- October 6th and use the owners indoor hot tub. Locheanhead is at the heart of the Loch Lomond and the Trossachs National Park enabling easy day trips to surrounding tourist areas and cities whether in the directions of Edinburgh, Glasgow, Stirling, Perth or Oban. Outdoor enthusiasts can select from fishing, walking, cycling, watersports, golf and horse riding. Whether you are here for sport, history and folklore, the local deer and ospreys or simply to relax in a breathtaking environment, Kim and Fraser will be delighted to greet you with a very warm welcome. NB: Kim and Fraser have built a new luxury holiday cottage with 2 bedrooms and 2 bathrooms, a fully fitted kitchen and a woodburning stove and a 26ft long open plan living area with full patio windows from the lounge and both bedrooms overlooking Loch Earn. Available from 2011, enquire now. 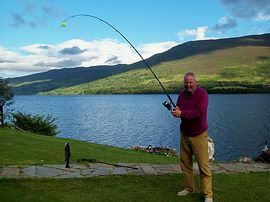 Briar Cottages garden on Loch Earn for fishing. 1 well behaved pet with 4 people, however 2 adults may bring 2 dogs at £20 per week. Barbeque, chiminee, ornamental landscaped garden, wooden decking with ornamental tables and chairs, sun loungers, picnic table, access to owners slipway, jetty 250ft lochside garden, summer house. From Glasgow follow the M9 to Stirling, by-passing the town and leave junction 10 signed Callander. 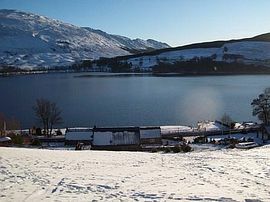 Take the A84 (Callander & the Trossachs) to Callander, continue through Callander on A84 via Strathyre to Lochearnhead. After passing the loch on your right, take the next turn on your right (A85 Crieff) and continue along the loch side until you see Briar Cottage. This is the thatched cottage on your left. Coming from Oban or Fort William, via Tyndrum and Crianlarich on the A85, continue on A85 for about 11 miles after Crianlarich to Lix Toll Filling station where the main road turns sharply right to climb up to Glen Ogle. Continue over the summit of Glen Ogle for about 5 miles after Lix toll. 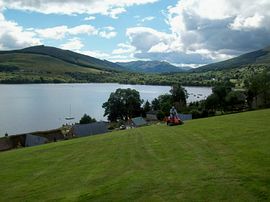 The village of Lochearnhead is at the bottom of the long hill. Turn left to follow the A85 and continue along the loch side until you see Briar Cottage. This is the thatched cottage on your left. From Perth or Crieff, follow the A85 via Crieff, Comrie and St Fillans to find Loch Earn on your left. Continue on this road to the "30mph" sign at Lochearnhead. Look out for the thatched cottage (Briar Cottage) on your right. Weekly rental is per cottage(not per person) and ranges from £300.00 to £750.00. Short breaks 3-4 nights charged at 70% of te weekly tariff. Prefer Saturday to Saturday weekly rental. Guests should arrive at 3.00pm on a Saturday and leave at 10.00am the following Saturday to enable thorough cleaning on changeover days. Little Briar Guestbook is filled with very complimentary comments about the magnificent and enviable location and scenery as well as the friendly hospitality. Kim is a member of the Federation of Small Businesses.